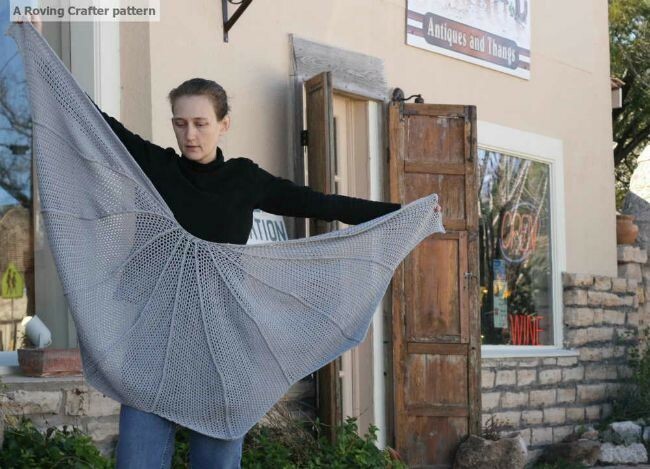 The Bat Wing Shawl was inspired by a group of crocheting friends of mine who wanted to bring attention to the declining numbers of bats all around North America. I’m in Austin Texas and my town is very fortunate to have a thriving bat population. For now. But an estimated six million bats have died due to a fungus that causes white-nose syndrome. This die off has been called one of the worst wildlife declines of the century. Once the fungus invades a cave, 90% of the bats living there die. The National Speleological Society tracks the disease, collects funds to support research, and explains what humans can do to slow the spread of the fungus. The devastation doesn’t get much attention and I hope we crafters can raise awareness. If you like this pattern, please consider sending in a donation to The National Speleogical Society. Before going forward there is something you should know. This is a pattern I’ve had sitting around in some dusty computer files for over a year. I’m brushing it off and posting it even though its never been tested. I’m the only person who has made one. A few of my crafty friends have started the shawl, and they seem to like it just fine. But none have finished. What does that mean? It means crocheter beware! It also means that by starting this pattern you are entering a solemn, unbreakable, pinkie-swear promise to let me know if you think you’ve spotted a mistake. 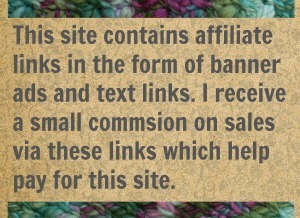 I have started a ravelry thread here on the Roving Crafters’ discussion board for any comments, concerns, compliments, pics, etc. Please let me know how your shawl is going! The shawl is made in wedges, five of them. There are four side wedges, 2 for the left side and two for the right side, split by a center wedge. Make two side wedges, a center wedge, and then two more side wedges. Repeat Rows 3 & 4 ten more times. Use the table below to keep track of the number of Hdc’s in each row. Btw, here is how the shortened rows look. Each time you stop and turn, you leave a “step” behind. Repeat Rows 29 & 30 ten more times. Use the table below to keep track of the number of Hdc’s in each row. 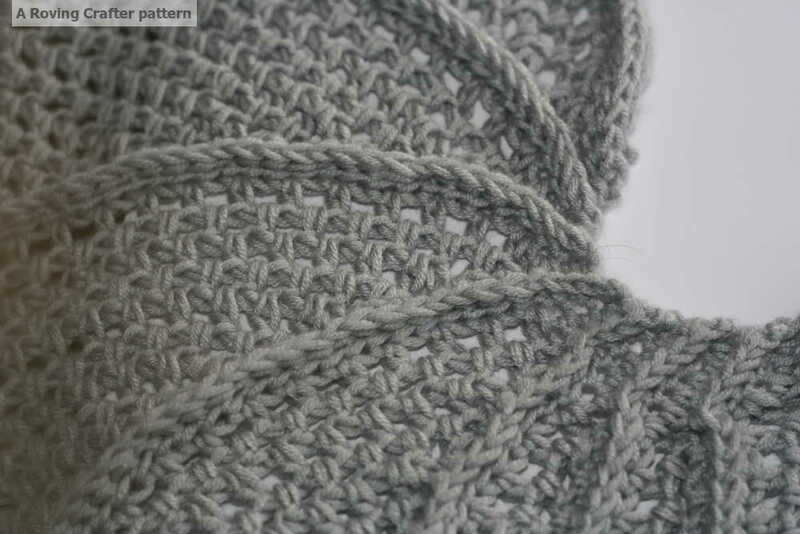 Row 52: FpHdc around every stitch (126 FpHdc), Ch 2 & turn. One side wedge is now complete. 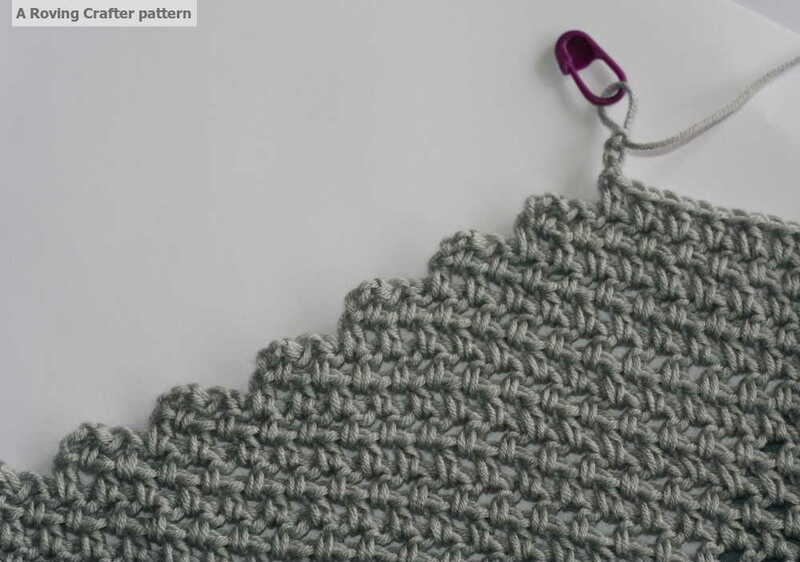 Repeat Rows 1 – 52 to make a second side wedge. The center wedge is finished. Make two more side wedges to complete the shawl. This pattern is pretty special to me and I hope you like it. You can use the “Print & PDF” button at the bottom of this post to make a print-friendly version of the pattern. 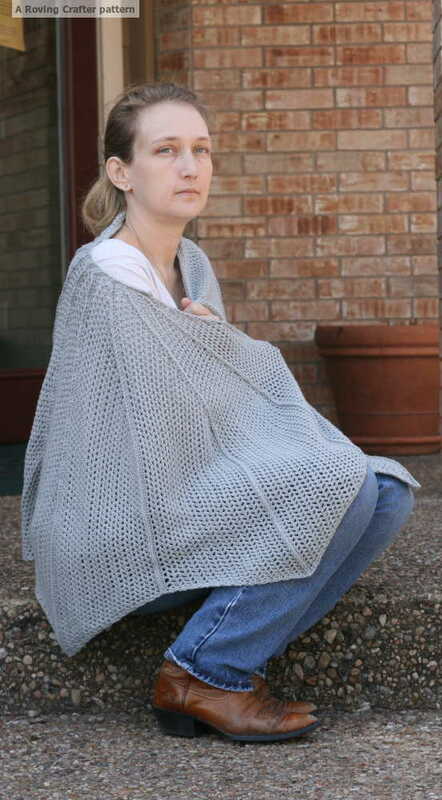 Check out our growing collection of original, free patterns here. 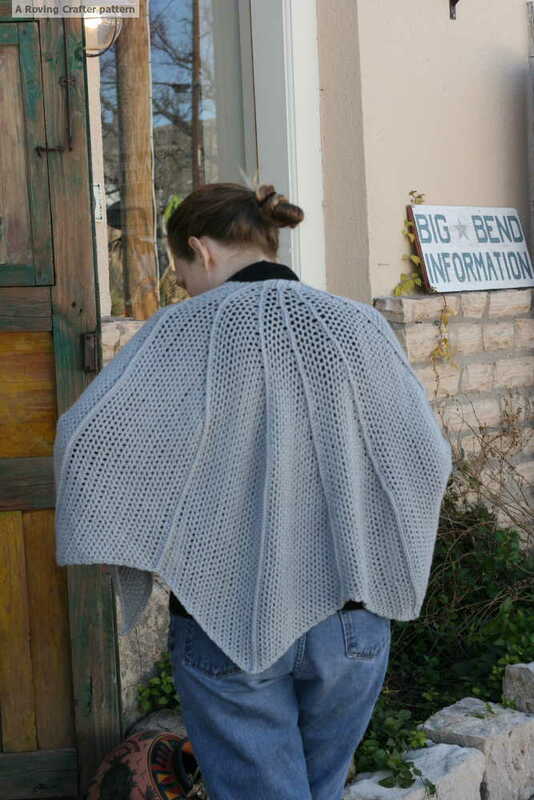 26 Comments on "The Bat Wing Shawl – A free crochet pattern"
Well you caught me! Yep, I thought I’d do a short video to demonstrate front post stitches before releasing this pattern. lol And I thought I was being so clever and sneaky! Now I feel really guilty. I’ve been wanting to get started on it. I have renewed inspiration. No guilt intended! And enabling the yarn habit…err… I mean inspiring crafters is what I do best. Yes. If I understand what you are asking (lol), the answer is yes. In Row 25 you put a stitch in each stitch and space all the way back to the neck edge, including in every stair left behind by those short rows. yes that does help, thanks! Sandy, after just a quick look around your blog I’m impressed by how close our interests are. Thank you so very, very much. Both for the kind words and the support. The Bat Wing went over pretty big on Ravelry and I guess now I know why, lol. 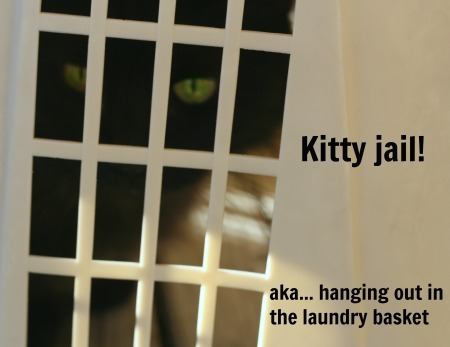 And of course I’ve been pouring over your lovely blog today. LOVE the mood blanket challenge. What a fantastic idea. I am sadly too incompetent at web page stuff to paste your link in our side bar. But…. that’s why we have Jess! lol. Jess will do it for me.